Queen Elizabeth I was the last Queen of England. Since her death in 1603 there has only been a Monarch (king or queen) of the United Kingdom. Her successor was James Stuart of Scotland who became James I of the United Kingdom. James’s accession meant that the three separate kingdoms of England, Scotland and Ireland were now united, for the first time, under a single monarch. 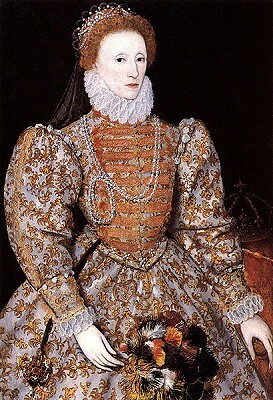 Queen Elizabeth I was not only the last Queen Regnant* of just England, but also the last Monarch of just England. Ann was the last of the Stewart (Stuart) monarchs. She was Queen of Great Britain and Ireland 1702–14. England (already joined with Wales) and Scotland formally united into a single state under the Act of Union 1707. Queens Regnant that followed Elizabeth – Mary II, Anne,and Victoria – were all Queens Regnant of the United Kingdom. “Elizabeth the Second, by the Grace of God, of the United Kingdom of Great Britain and Northern Ireland and of Her other Realms and Territories Queen, Head of the Commonwealth, Defender of the Faith.”. ← Will Prince William’s wife become a Queen? Using Google Translate recently, I kept coming across the term ‘spud’ or ‘spud up’ when trying to translate kitchen implements. In British English a ‘spud’ is a potato, but there is no verb to ‘spud up’. Could you please let me know what these terms mean in American English?